The past year I had a couple goals. The first was to cut down on tea purchases and the second was to settle into more normal purchasing and consumption tea habits. These were motivated by life circumstances and a desire to be more balanced with my tea habits. I already own a lot of tea, much of which I enjoy drinking, and my behavior should reflect that. With these basic thoughts in mind, I’d say I’ve been partially successful thus far. There have been a few impulsive extra cake splits and purchases than I would’ve liked and the obsessive mind will search for endless ways to get around tea rules (cake splits, sample buys), but by and large I’ve bought a whole lot less tea this year. It can be a lot of fun to hunt down and try + buy a lot of different teas under the premise of improving and aging your current tea mass. It is also foolish and expensive to do so indefinitely. There’s a ton of different rationalizations that we can use to trick ourselves into buying more tea (it’s an investment, for the grandkids, etc.) but it can culminate in pricey purchases with real monetary consequences. For most people with finite resources, continuously chasing better tasting tea forever won’t result in a tea nirvana. It is a recipe for dissatisfaction and ultimately a pretty poor use of money. Cutting down is a lot easier said than done, and takes a lot of resisting the shiny new objects that are often new vendors. You never know when another “can’t miss group buy or cake split” will appear. All of this doesn’t mean necessarily I’ve completely stopped looking out for more or better tea, just that I hope to do so with more restraint and moderation. As fun as it was to stare down 20 samples of young pu’erh, I’ve lost my appetite for these massive samplings that I did regularly a couple years ago. I still am a strong advocate of buying samples, especially when getting started. But there is also value in really getting to know teas that you own with repeated sessions. Think about how you’re drinking.. Over the course of a few months, it is probably more informative to drink 20 teas, 5 times each, rather than 100 teas, once each. With so many teas to try, checking teas off like a passport or stamps is tempting but can end up being a never-ending, misguided task. I’ve also been talking about cutting down on sampling for a while. Over the course of my lifetime, drinking teas I own is going to be the bulk of my tea consumption. It’s a lot more comfortable and less exhausting to drink teas that you know rather than trying to explore and take notes on every new teas. I’ve also found that my consumption has gone down by quite a bit. The pace of drinking is more than ever dictated by the pace I actually want to drink. While I definitely still drink daily, drinking a session or two of a tea a day is plenty for me. I consider this all to be a healthy evolution. 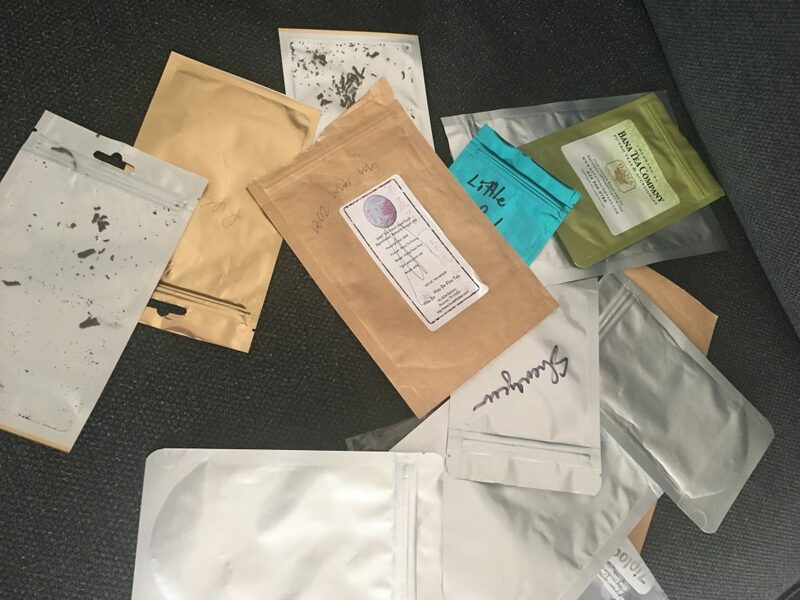 Part of running a tea site is an endless array of samples. Some of these are inevitably sample purchases, others are vendors sending their products. Depending on how many you accept it’s very easy to get a pretty overwhelming amount (i.e. Oolong Owl 2016). In 2014-2016 when I was doing big samplings more regularly, I’d keep 20-30 samples of a similar theme in giant ziplocks and stash them in big boxes. In mid-2015 when I realized that my pile of tea was out of control (estimated 500 samples at the time) I started a very simple list of teas that I had finished off. The idea was to motivate myself to get rid of stuff I’d never drink and finish off teas that I did want to drink and get much pickier about teas that I’d accept in the first place (or dump/give them to Denny). An unconsumed three year old sample really isn’t doing anyone much good.. These days, I mainly give the sample a bit of time to rest and try to finish it off or give it away within a month. No point in letting these things sit around. A small amount of the previously much larger sample clutter. This entry was posted in Article, Tea Learning, Tea Musings. Bookmark the permalink. Poignant statement that resonated with me; actually, more like a pang of guilt, as I too have been guilty of sample hoarding early on in my tea journey. Recently I’ve found enjoyment in going back and actually paying attention when brewing most of my older teas. I’ve considered it, but I usually abhor packaging up tea. Typically, it is just give aways for my local friends :). When you have lots and lots and lots of teas, (we are all prone to a bit of tea hoarding!!) you easily lose sight of their value. Yes undoubtedly it can be an occasional delight to discover a tea at the back of your stores you have forgotten about and rediscovering it is like “Friends Re-united” , but I have found it better to have less and spend time enjoying what you have more frequently as you put it so well in your own words. Oh, your tea pantry is so organized compared to mine! I regularly try to find some good reasons to stop buying more teas and herbs because my collection is more than enough. But well, I love tea and I am curious about new ones! i agree with the sampling bit. Often times if you drink the same tea over months, you will notice different tastes (perhaps affected by the way our body is a little different each day due to variety in the diet and other experiences). If you only get an impression of a tea from one or two tastings, you might miss something. There are teas that i thought i liked a lot from a 20 gram purchase, but after buying a later 100 gram purchase, i realized that it wasnt as good as i thought at first based on the initial 20 grams. Yeah. While I think sampling is a good thing, there’s a lot of value in getting reps in through just drinking up cakes too.